This documentary is in tune with the current “back to the roots” movement that we are witnessing and that is taking place all over the world today. More specifically, it deals with the architects who are credited with bringing and adjusting the ancient yurt to the European lifestyle and it talks about the role that Sacred Geometry should play in the construction of our living spaces. 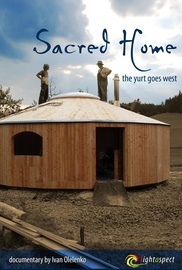 Furthermore, the documentary takes a peek into the lives of those that are actually living in yurts and those that are attending seminars in order to learn how to build their own yurt.